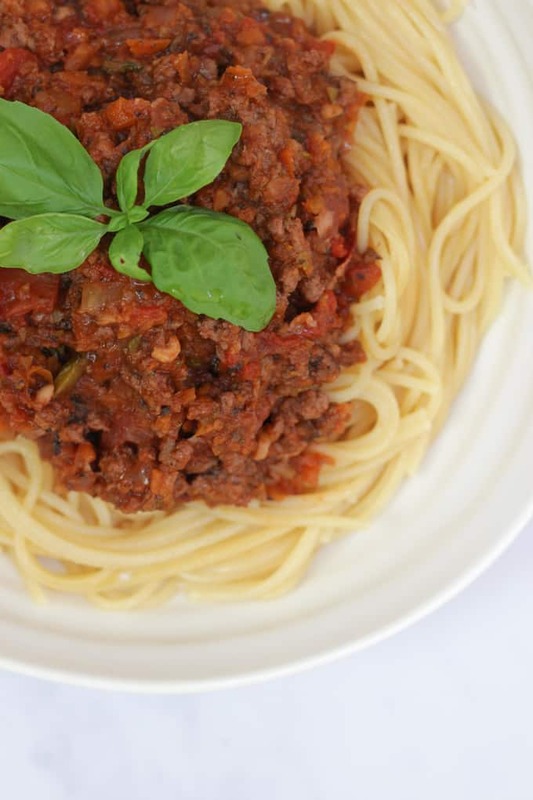 A traditional Bolognese sauce (with hidden vegetables) – An easy peasy recipe for a family favourite dinner. Quick to make as a midweek meal, brilliant as a freezer filler and packed with extra veg. All the family (including the kids!) will love it. We are fully back in the swing of a new school year here. My organised mornings with book bags at the ready and socks in pairs (pairs! Imagine that!) lasted all of a week. Tell me parents, is there an answer to the morning chaos? I’m a fairly organised person generally but somehow, school mornings seem to send us all a tad mad. However, I am determined to crack the after school muddle that we sometimes find ourselves in. I am aiming to organise myself to not have to work or do chores once the children are home. This includes getting the freezer filled with at least a few batches of homemade meals ready to whip out at a moments notice. 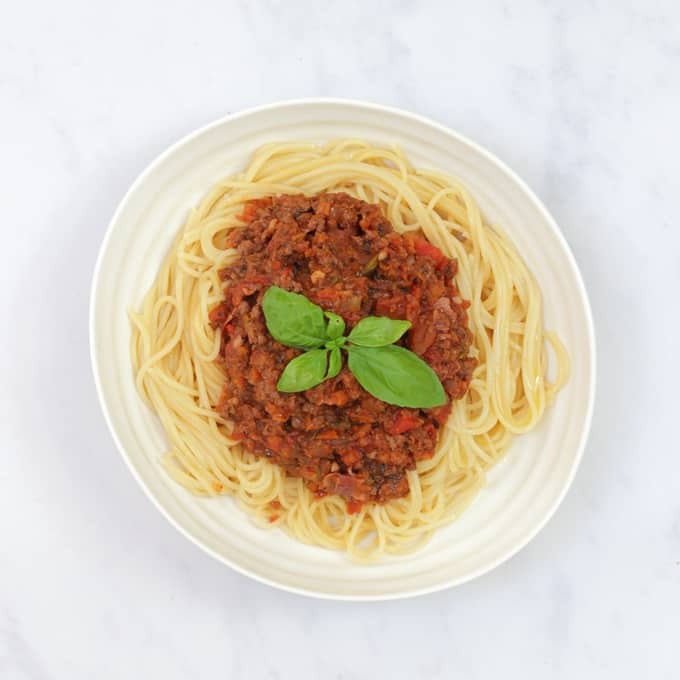 I decided to make this hidden vegetable bolognese as a super easy way to get heaps of good stuff into children at dinner time. The benefit also is that once frozen, you’ve got meat and vegetables all ready for dinner in one dish. What’s your favourite freezer filler meal? Or ways to sneak vegetables into your family diet? 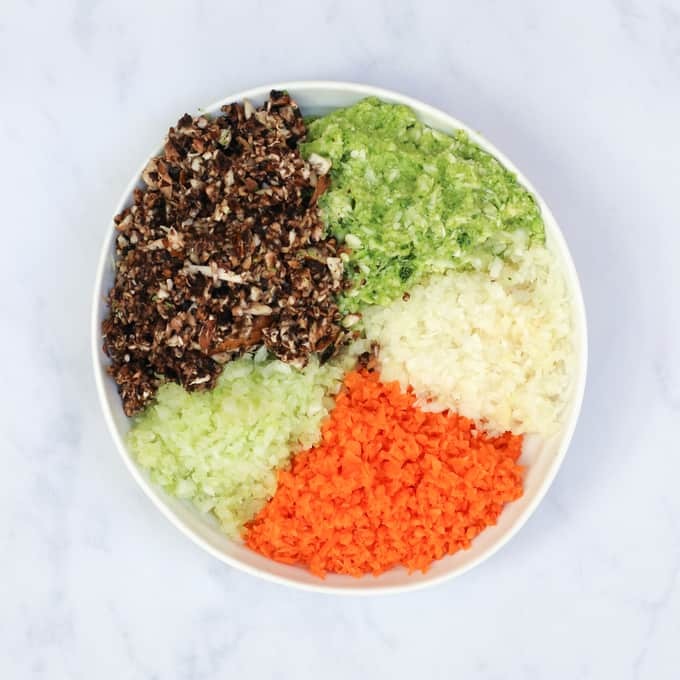 Ok, its fair to say there is a fair bit of chopping to do for this Bolognese Recipe to allow you to pack all of these amazing vegetables in unnoticed! But I have a little cheat to help me with this. I use an electric chopper which whizzed through carrots, onions, mushrooms, courgettes and celery. A really fine chop does make a difference to the texture of the Bolognese. 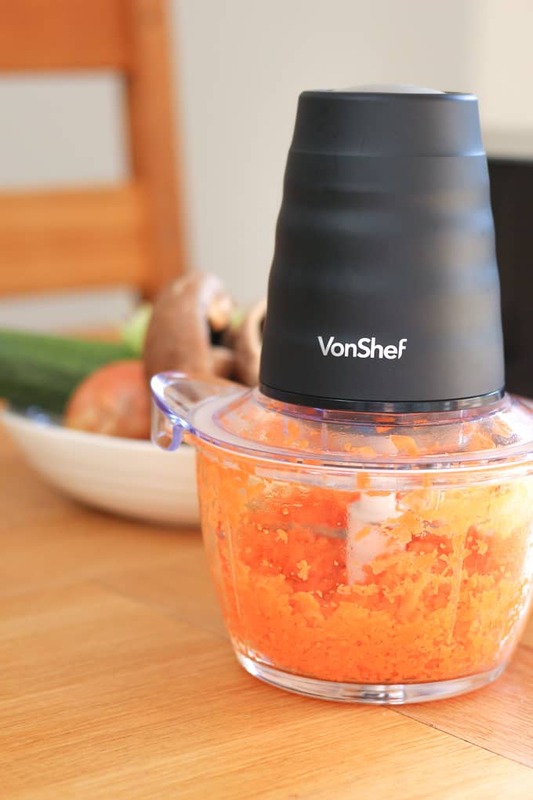 I would recommend this Mini Food Chopper, its great for hidden vegetable dishes too like my Yuk Sung Easy Pork Mince Recipe, and it is so helpful when batch cooking too. 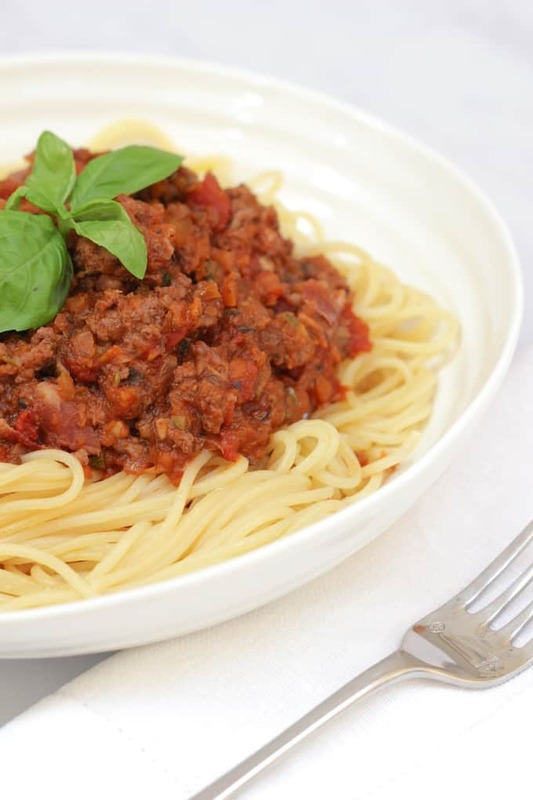 HOW DO YOU FREEZE BOLOGNESE SAUCE? 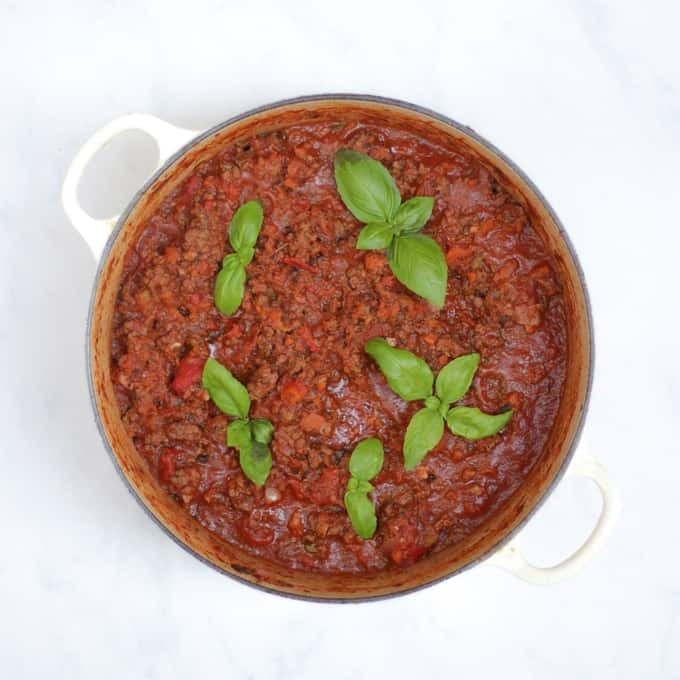 I ALWAYS make a double batch of this Bolognese sauce recipe, as if you’re preparing once, why not do twice and have dinner from the freezer another night? Just make double the recipe (minus the pasta) and freeze in freezer safe containers (like these containers on Amazon which I LOVE for this purpose). Then just allow to thaw and reheat fully before serving over freshly cooked pasta. This freezes so well. Perfect dish to pull out as a base for heaps of other meals. When it is totally cold, I package up in these dishes, label and freeze. Mini Chopper (so useful if not using pre cut veggies). I cooked my bolognese in my beloved favourite ever casserole dish (available on Amazon). My favourite ‘spoon-atula’ – I use this every single day (in fact I have a few of them!) Perfect for scraping sauces from pans and getting the last bits out of bowls. Oh and LOOK AT THE COLOURS! If your children will spot even the green of the courgettes, you could peel them first. My favourite way to cook bolognese is actually in the oven as I think it gives a slightly more rich flavour. So, if you have time, do everything up until point 5 of the recipe below, then pop in the oven at 150C for about 2 hours, checking occasionally to add some more wine/stock if it’s drying out. I’ve cooked it on the hob here though for the sake of midweek speed. Hope you enjoy this recipe as much as we did. 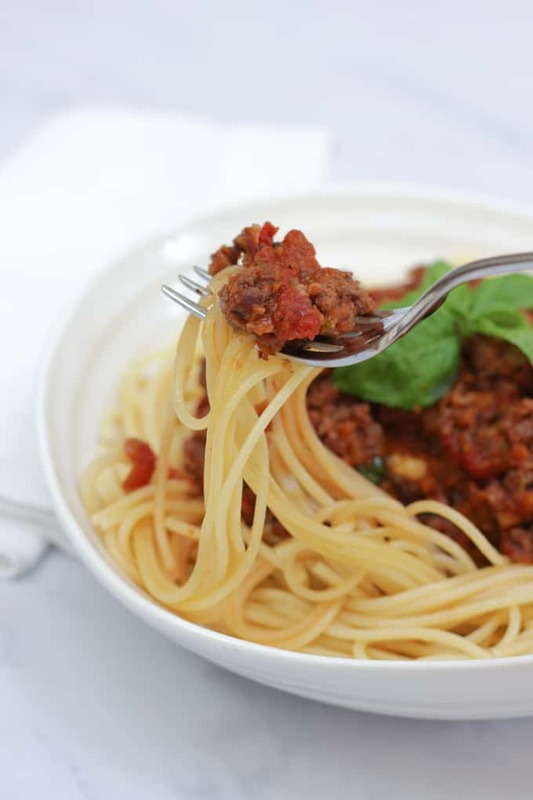 I’d love to know how you got on and what you thought of it if you make this Bolognese sauce recipe. Please rate the recipe and leave me a comment below if you do. 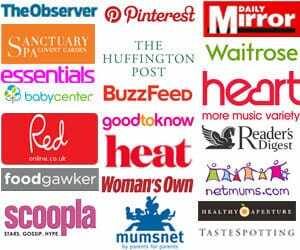 Fancy some more pasta recipes? How about my Chicken Pasta bake or Easy Meatballs Recipe? Also, if you fancy showing me a photo by tagging me on Instagram (@tamingtwins), I LOVE to see your creations. 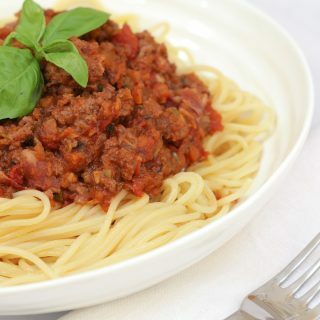 Spaghetti Bolognese (with hidden vegetables) - An easy peasy recipe for a family favourite dinner. Quick to make as a midweek meal, brilliant as a freezer filler and packed with extra veg. All the family (including the kids!) will love it. Use your chopper or food processor to finely chop the carrots, mushrooms, courgettes, onions and celery. Meanwhile, in a large, heavy saucepan, fry off your small pieces of pancetta. Remove from the pan to a large dish. In the fat left in the bottom of the pan, brown your mince over a medium high heat. Allow it all to turn brown and start to crisp slightly. Remove from the pan and add to the dish with the pancetta. Now add the garlic to the pan and fry for 2 - 3 minutes, before adding the finely chopped vegetables. Fry them for about 10 minutes until soft. Add the pancetta and mince back to the pan. Add the tinned tomatoes, red wine, a good grating of the fresh nutmeg (about a quarter of a nutmeg) and salt and pepper. Leave the heat on medium, with the lid on and allow to bubble away for at least 30 minutes (an hour on a very low temperature if you have time). Remove from the heat and add in chopped or ripped basil leaves. Serve with spaghetti and grated parmesan.